The 2017 Prius c is offered in two models: Prius c (with an available Upgrade Package) and Prius c Technology. New for 2017, every Prius c now comes standard equipped with Toyota Safety Sense – C. This bundle of active safety technologies – including the Pre-Collision System, Lane Departure Alert, and Automatic High Beams – enhances driver abilities and mitigates the effects of collisions. Also new for 2017, every grade is decked out in a matte black body kit, including front bumper lower spoiler, side mudguards, front grille and rear bumper. Models enhanced with the available Upgrade Package now sport a redesigned 15” alloy wheel, while 15” alloy wheels and redesigned fog lamp covers grace the top-tier Prius c Technology. Under the hood, the Prius c’s Toyota Hybrid Synergy Drive is built around a super efficient 1.5L Atkinson cycle engine, continuously variable transmission and powerful storage battery. This combination generates 99 net system horsepower, ideal for the urban landscape. Even more impressive, Prius c delivers city and combined city/highway fuel efficiency ratings of just 4.5L/100km and 4.7L/100km, respectively. 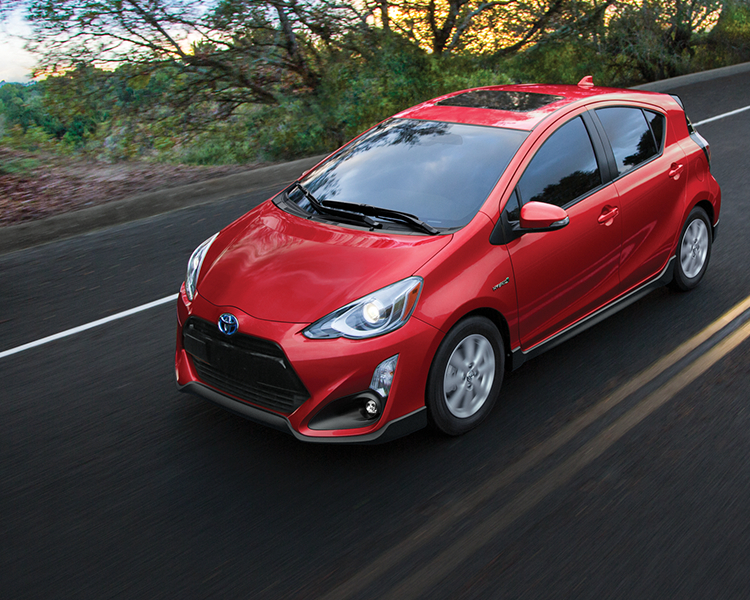 Plus, Prius c features several fuel-friendly driving modes – including ECO mode and EV mode. Prius c serves up big helpings of versatility, with its hatchback design and fold-down seatback, there’s up to 484L of cargo space available – enough to stow four golf bags or a stack of snowboards. The body’s sleek, triangular profile is not only futuristic, it’s also super efficient – slicing through the air to minimize resistance – and is available in an expressive palate of vibrant colours. Safety is standard on every Toyota, so in addition to Toyota Safety Sense – C, the Prius c also features the Star Safety System – six active safety technologies to help drivers avoid incidents. Other safety features include seven airbags, LED brake lamps, a tire pressure monitoring system, and more. Every model is impressively equipped with comfort, convenience and technology features. The 2017 Toyota Prius c (Starting MSRP: $21,975) features a 6.1” Display Audio system with USB input and Bluetooth® capability, air conditioning with automatic temperature control, a 3.5” LCD multi-information display, power door locks with keyless entry, UV glass protection, outside temperature gauge, steering wheel-mounted controls for the audio and environmental systems, plenty of thoughtful in-cabin storage, a 12v accessory power outlet for personal electronics, 15” steel wheels, dual power adjustable and heated mirrors, rear spoiler, LED headlamps, and more. This model may be enhanced with an available Upgrade Package (Starting MSRP: $23,470), which adds two additional speakers to the audio system, plus additional adjustments on the driver’s seat, a 60/40 split for the fold-down rear seat for added flexibility, premium cloth seat coverings, cruise control, variable intermittent wipers, an instrument panel clad in synthetic leather, a tonneau cover, additional in-cabin storage, 15” alloy wheels, and a back-up camera. The 2017 Prius c Technology (Starting MSRP: $26,980) features a six-speaker audio system with integrated XM Satellite Radio, Display Audio with Navigation, access to the Gracenote music database, advanced voice recognition, and more. Other technology features include Touch Tracer controls on the steering wheel, the Smart Key System with Push Button Start, and more. The Prius c Technology also features LED fog lamps, a power moon roof, 15” alloy wheels, cruise control, additional in-cabin storage features, synthetic leather on the steering wheel and instrument panel, a tonneau cover, 60/40 split for the fold-down rear seat for added flexibility, additional driver’s seat adjustments, seats finished in SofTex synthetic leather, and more.